To help us enhance our services, the Companies Registry has conducted the 2018 Customer Service Survey. The survey results showed that over 80% of our customers gave a rating of “Very Satisfied” or “Satisfied” with our services and the overall customer satisfaction rating was 3.86 (on a five-point scale). 34.1% of the respondents also indicated that the services of the Registry had improved as compared to the previous year. 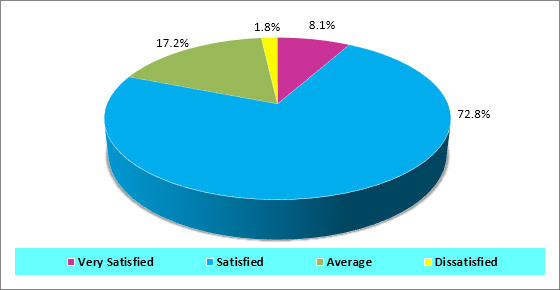 The level of overall customer satisfaction and satisfaction ratings for individual service attributes are highlighted below. A five-point scale, ranging from “Very Satisfied” (Score 5) to “Very Dissatisfied” (Score 1) is used for respondents to rate the satisfaction level of various services. Satisfaction rating is the mean score based on the five-point scale to indicate the customer satisfaction level in the overall performance and individual service attributes.